Top Five Mid-Priced 7+ Quart Slow Cookers . This programmable cooker has one-touch controls, a stainless steel finish and dishwasher-safe removable parts. There are high and low heat settings as well as selectable cook times of four, six, eight or ten hours. After the chosen cook time is up, the appliance will automatically go into keep-warm mode. 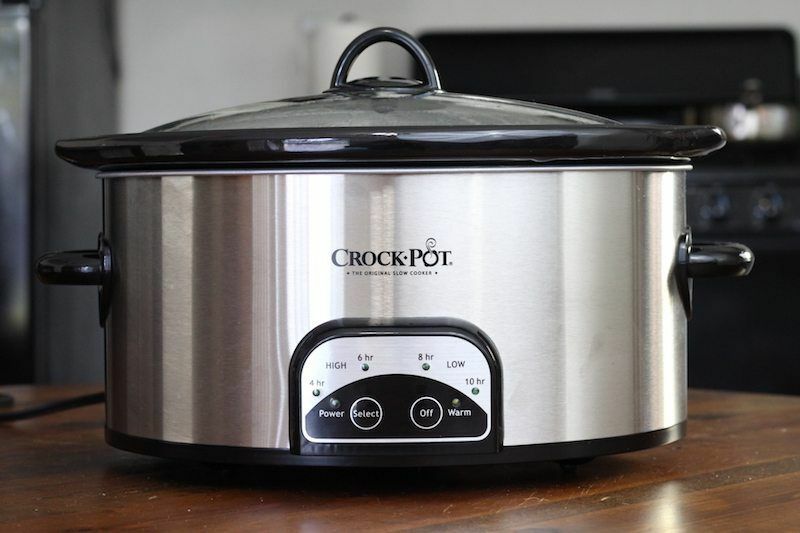 Crock-Pot is the original brand of slow cookers, but the company doesn’t offer many seven-quart models, which means company-loyal consumers don’t actually have that many sizable appliances to choose from. 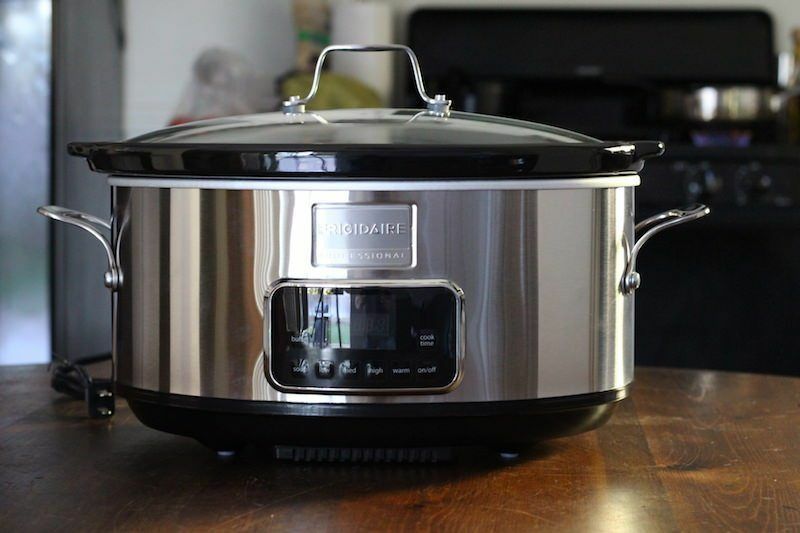 If you don’t want a lower-priced manual cooker, this programmable pick is the best option within Crock-Pot’s large-capacity offerings. For less than ten dollars more, you can add to your cart a seven-quart travel bag that locks in heat and has a convenient carrying strap. With an easy-to-read digital LCD panel and ergonomically-designed buttons, this oversized programmable cooker certainly packs a punch. There are low, high and warm temperature settings in addition to cool-touch handles and a see-through lid. Once your selected cook time is up, the appliance will automatically switch over to warm mode. The ceramic vessel is non-stick and ideal for cooking large quantities of food. 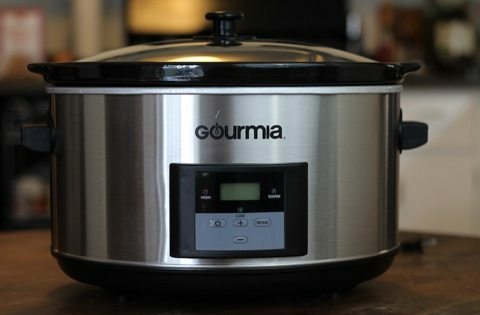 Although this model from Gourmia is perfect for some consumers, the seven-quart model–with it’s fifty-dollar price tag–may be a better fit for other cooks. Either way, both models have the same useful settings and similarly positive reviews. Based on your particular circumstances, decide which capacity is going to serve you best. Optimizing performance and durability, this fully programmable cooker has six one-touch preset options that make cooking easy: buffet, soup, low, medium, high and warm. As desired, you can also set a specified cooking time and activate the keep-warm control so it will naturally kick in once the cooking period is done. The bright LED display is large and easy to read while the overall shape of the crock is designed to make the most of your counter space. The stainless steel exterior is stylish and the die-cast handles make for easy transporting. Frigidaire Professional is a division of Electrolux, one of the largest home appliance brands in the world. 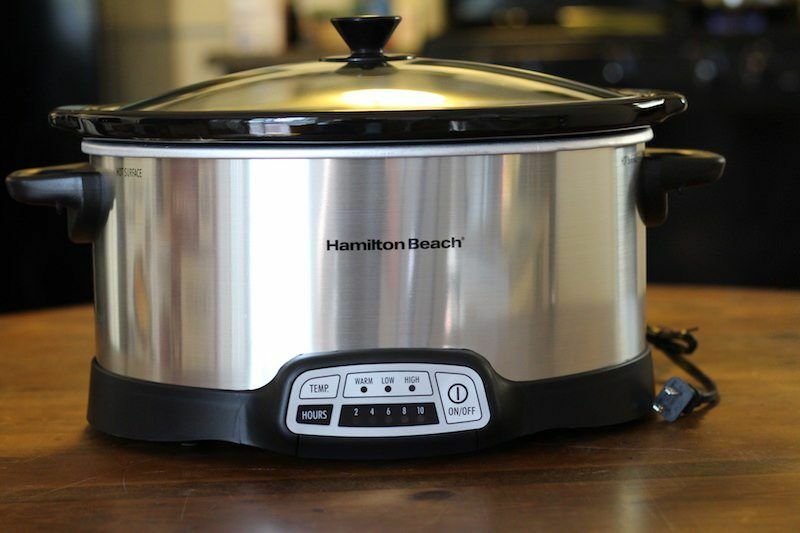 The company’s products are synonymous with quality and this programmable slow cooker is no exception. Consumers love this model and you likely will, too. 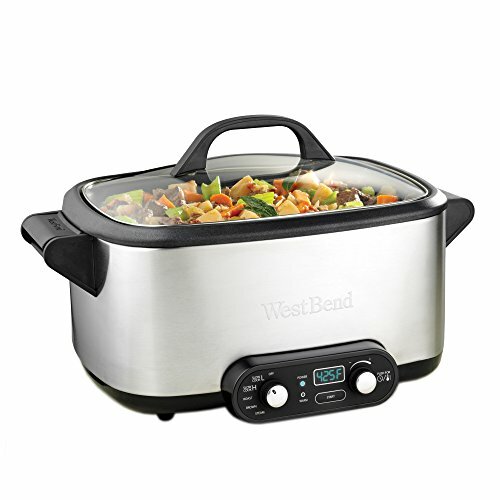 With a seven-quart capacity, this multi-use cooker features four cooking modes: brown, steam, roast and slow cook. When slow cooking, you can select a high or low heat setting and, after the selected cook time is up, the appliance will automatically switch to a keep-warm setting so your food stays at a great ready-to-eat temperature. The cooker also comes with a rack that’s useful when roasting or steaming. West Bend has been in the home appliance market for over a hundred years. The specs on this multi-cooker are amazing, but some consumers have reported that this appliance didn’t last as long as they had hoped. If you want a more basic model that will last for years and years, you may want to skip this pick; otherwise, this versatile appliance may interest you. 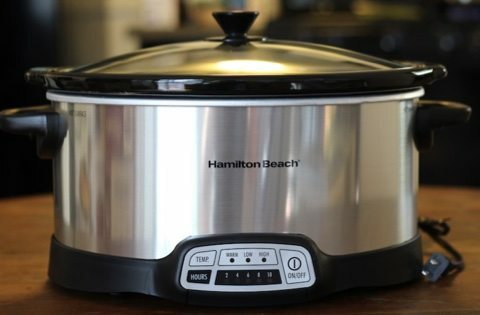 This cooker from Hamilton Beach has temperature settings of warm, low and high as well as programmable time options of two, four, six, eight and ten hours. When your chosen cook time is up, the auto-warm feature will kick in. The removable parts are dishwasher safe and the touch pad is easy to wipe off. Hamilton Beach is one of the most trusted companies in the kitchen appliance industry. Unlike some other options from the same brand, this model doesn't feature a clip-down lid for worry-free traveling, but the product does have amazing reviews and is a great size for feeding a crowd. For the price, this is a great mid-range pick. Your individual preferences may lead you to a different slow cooker, but generally speaking, we recommend picking up Electrolux’s Frigidaire Professional Stainless Programmable Slow Cooker. We like that this seven-quart appliance offers versatility with programmable cooking times and six preset options. We also like the LED display, counter-conscious shape, stainless exterior and nearly perfect consumer reviews. 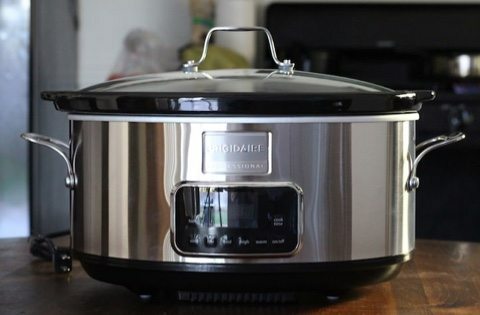 As you can see, you really don’t have to spend over a hundred bucks to get a durable slow cooker that has programmable features, a name brand you can trust and a cooking capacity that will enable you to host a packed dinner party. We’re impressed by all of the models included in this review and hope that whatever appliance you end up buying serves you well. 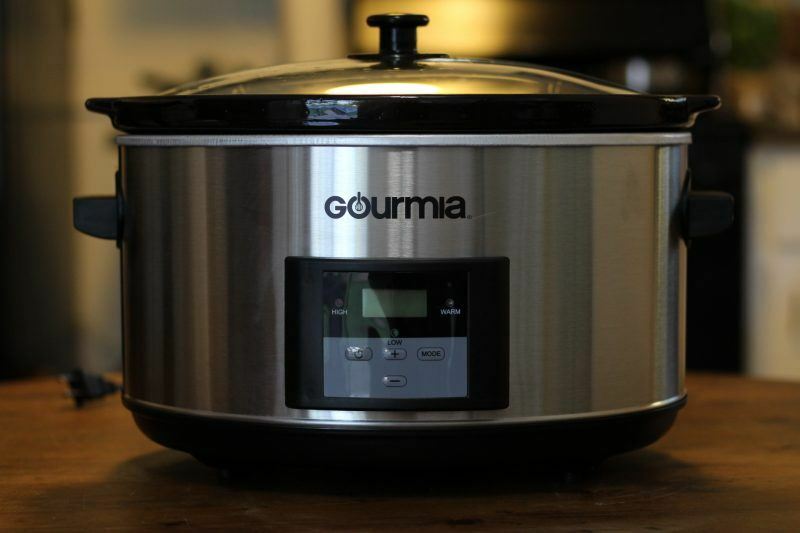 With a quality slow cooker headed to your house, happy days will undoubtedly be ahead.